In your experience, how has the response been on the photography/prints since they have been released? The response to Lange’s photos has been overwhelming. Quite a few people have expressed their appreciation for publishing the photo essay, including several people who had relatives imprisoned in the camps. One woman mentioned that her great grandfather was pictured in one of the images, and I’ve heard many similar stories of personal connections to the photographs. I think people also appreciate that the proceeds are going to the American Civil Liberties Union, an organization that is still challenging the government when they violate civil rights. When I started working on this project, I had hoped that I could sell a few prints and donate a small amount of money to the ACLU. To date, I’ve sent $35,000. How come you’ve got access to this photography, while it was suppressed and unpublished for decades? Since Dorothea Lange was employed by the government when she made these photographs, the images are all in the public domain—anyone is free to share and publish the images as they choose. The War Relocation Authority impounded the photographs for the duration of World War II, but in 1946, they sent the prints and negatives to the U.S. National Archives. Once in the Archives, the images were available for unrestricted public use, though they certainly never had the notoriety they deserve. The Archives began digitizing the work in the 1990’s, and these images have been available through their online catalog since 1998. I was able to collect high resolution scans that the Archives created, and I compiled the photo essay and selected a few of the images to print. With your Anchor Editions project, you dig into history of art that you find interesting. What is it exactly in Dorothea Lange's photography that appealed to you so much, compared to any other photography from the Great Depression and/or WW II era? Lange is often compared to her contemporaries like Walker Evans and Ansel Adams. She and Evans were both employed by the Farm Security Administration in the 1930s, with Lange famously documenting the challenges faced by farm workers in California after the Dust Bowl migration. Based on her work for the FSA, the government hired her and several other photographers to document the “relocation” of Japanese Americans during World War II. A year after Lange photographed the Japanese incarceration and concentration camps, Ansel Adams was invited to photograph at the Manzanar camp in California. Adams’ images of the prisoners show them as resilient, happy, and well-adjusted to their life in the harsh desert at the foot of picturesque Mount Whitney. Lange was far more humanistic in her approach to documenting her subjects—documenting not only the reality of the conditions, but the emotion and the uncertainty faced by the Japanese and American citizens as they were forced to dispose of their possessions and livelihoods, climbed aboard the buses and trains, and adapted to their new lives in converted horse stables and military-style barracks behind barbed wire and guard towers. Where Adams’ photographs are closer to propaganda encouraging the viewer to think that the people in the camps are thriving despite their adversity, Lange invites her viewers to empathize with her subjects, and connect with the difficult reality that her viewers are just as culpable as the military and government. To us, in a way the photography feels like a reminder of how history could repeat itself. It’s a big question, but do you think there’s indeed a parallel to her photography and society now? If so, in which way? I do think that the recent response to Lange’s photographs is directly related to the current political climate. I began looking at these photographs after seeing a clip of Trump supporter Carl Higbie claiming that the Japanese American Internment could be legal precedent for a registry of Muslim Americans proposed by Trump immigration advisers. This made me quite angry—have we forgotten that even the U.S. Government admitted, though far too late—that the Internment was a violation of civil and human rights? It is clear that the tide of racism and xenophobia that led to the Japanese concentration camps in 1942 is swelling again. 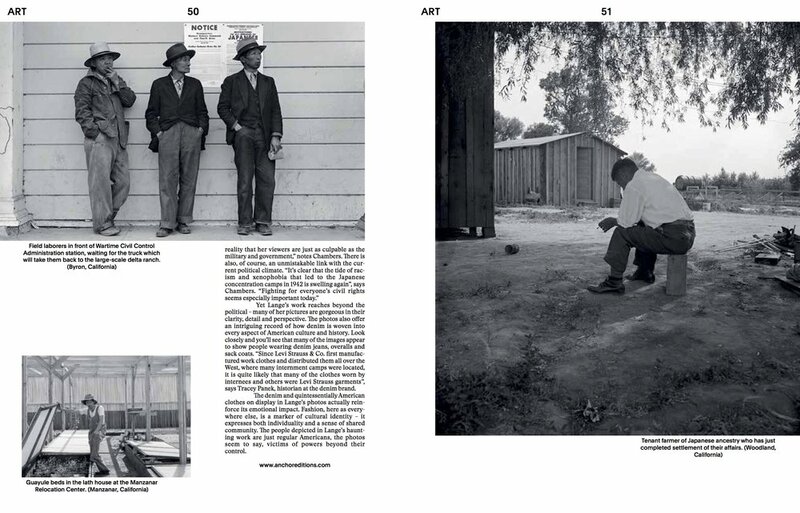 I recalled seeing Ansel Adams’ photographs of Manzanar, and in the course of researching those photographs, I came across Lange’s work and was struck by how her images are far more critical and empathetic. I hope that seeing photographs from this shameful period in our history will remind us that we need to resist any violation of civil and human rights when it happens today.